Start your ‘Home Grown’ project with culinary herbs. I couldn't get through a weeks cooking without Rosemary, Sage, Garlic, Winter Savoury, Thyme, Bay, Mint or Oregano. 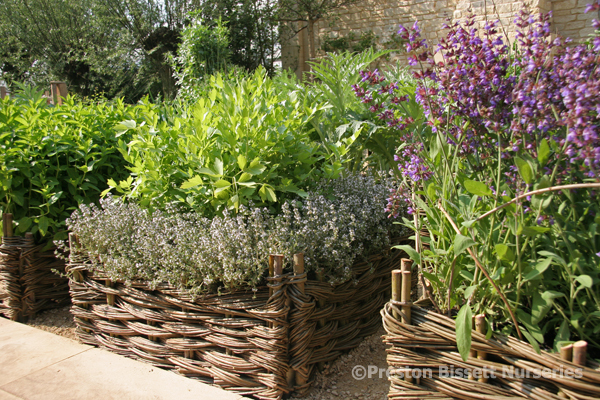 Plant them in your gardens borders or host them in pots easily accessible for a quick handful, by the kitchen door. Where would we be without Garlic, Rosemary and a drizzle of Honey on our mini roast potatoes. Thyme and a little lemon on our Roast Chicken. Oregano crushed into our Bolognese. Winter Savoury, Thyme and Bay flavouring our winter stews. Mint sauce to accompany our Lamb Chops. Horse Radish root to go with our Roast Beef. These are indispensable plants. All very easy to grow. 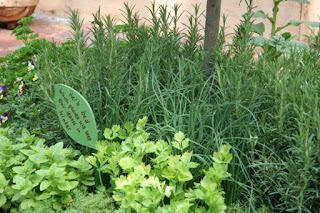 Many herbs are alpines or Mediterranean plants and need a well drained soil and a sunny position. I would recommend mixing 50% grit with your compost to ensure the drainage is good. They can be planted in the ground or grown in containers but do not plants them in a position where they will sit cold and wet in the winter. Fine silver or hairy leaves of plants often offer the clue as to the conditions they will tolerate. These types of leave can evaporate moisture and therefor tolerate more sun and heat. Many of the shade tolerating plants have very large leaves so they can soak up a lot of light when there is very little available. Lolly pop bay trees are ideal center pieces for herb beds and such a useful plant. 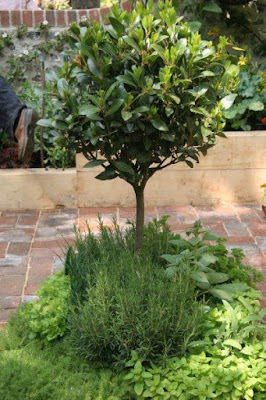 (Equally little olive trees could look spectacular). Every stew and in fact most dishes we cook benefit from a few bay leaves. We need to dry some and keep them in a jar for the winter along with our other most useful herbs. There really is no need to be buying anything. They are very easy to air dry and stored.